For all you young kits reading this, Love's Melody was a song and CD title by the Searchers. I'm going serenade you with a song from that CD; one called Hearts in Her Eyes. This is my version of how the song should go. I got hearts in my eyes / I got hearts in my eyes. Like a cat in a pet shop / I can't stop. I want all the nip / I got hearts in my eyes. Click on image to hear song. Awwww SMOOCH. That is a bootiful song CK. Happy Valentines Day CK. Mario SMOOCHES. Happy Valentine's Day. You look terrific CK, but that is how you always look! Happy Valentine's Day! What great heart eyes you have and what a super song. Happy Valentine's Day to you and your family. Big hugs to everyone. 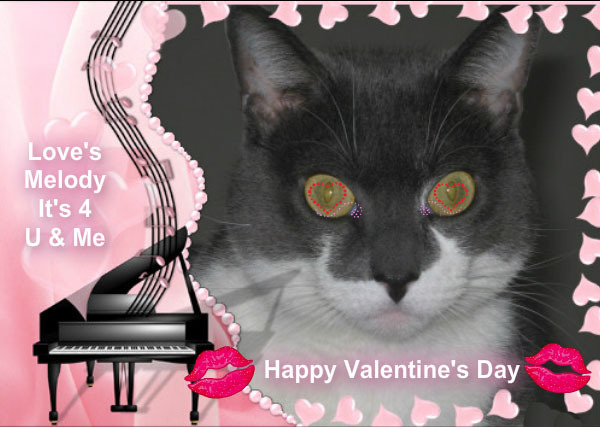 Happy Valentine's Day to you and your humans, CK! CK, I am missing you! I went to Sparkle's but did not see you there! I've looked on Twitter and sent an email. Has the King been stood up???? Wow, that is one gorgeous picture of you CK. Happy Valentine's Day, hope you had a great day! So now you're leaving secret smooches for Spitty?!?!?!?! What's up with that CK. Spill! Great song for the day : ) Love all your hearts too. Oh no CK, not you too? Spitty has been efurrywhere! Great song stylin', CK. We hope you made it to Sparkle's party. Happy Valentine's to you, and your peeps, too!